Antibodies are increasingly becoming the preferred choice to treat several disorders such as respiratory diseases, oncology, and inflammatory diseases. The rising application of these antibodies in drug development increases revenue generation in the mAbs market, contributing to the overall market growth. Globally, technological enhancements and huge R&D in genomic studies, continuous improvement and innovation in Monoclonal Antibodies technologies and growing population are the prime growth drivers of Monoclonal Antibodies market. 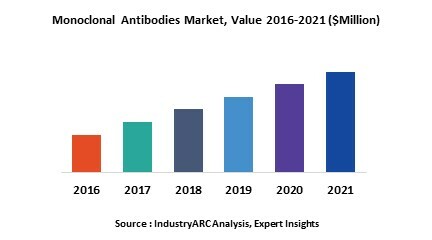 In addition, Increase in adoption of Monoclonal Antibodies in emerging economies such as China, India and others, will create new opportunities for moloclonal antibodies market. However, higher cost of the research and development, and complex government approval processes are the key restraints for moloclonal antibodies market. Globally, Asia Pacific will be the fastest-growing region in the mAbs market and is likely to grow. Much of the region’s growth can be attributed to the rising occurrence of diseases and healthcare investments provided by the respective governments and increased out-of-pocket expenditure by individuals. Moreover, the rising number of initiatives undertaken by major vendors to assist patients in the Asia Pacific countries and recent launches of new products are significant contributors to the high sales of sales mAbs in this region. This report identifies the global Monoclonal Antibodies market size in for the year 2014-2016, and forecast of the same for year 2021. It also highlights the market drivers, restraints, growth indicators, challenges, and other key aspects with respect to global Monoclonal Antibodies market.